The Autohub Group is committed to upgrading the skills and standards of its workforce by becoming an Institute of Motor Industry (IMI) Certified Institution. As the only international automotive awarding organization, IMI works with government and industry leaders across the world to improve training standards and skills within the sector. With this certification, the Autohub Group will provide IMI training across their vast brand portfolio. Currently, the group distributes Rolls-Royce, MINI, Lotus, and Piaggio while also operating dealerships for brands such as Ford, Hyundai, Mazda, and Nissan. The Autohub Group is also the sole dealer for the Nissan GT-R in the country. “It's a big leap for the Autohub Institute of Technology (AIT) to be an IMI Certified Institution. With our full commitment to produce better and highly-trained automotive technicians, we aim to prove that IMI made the right decision in certifying and collaborating with AIT here in the Philippines. Our state-of-the-art and advanced training facilities, which includes e-learning and actual workshop training, will make our graduates more experienced in the most current software used by the automotive industry leaders in terms of diagnosing and repairing of vehicles. We are very optimistic in this partnership because we know AIT can be the provider of automotive technicians across the globe in the near future,” said Mr. Mr. Willy Tee-Ten, President of the Autohub Group. 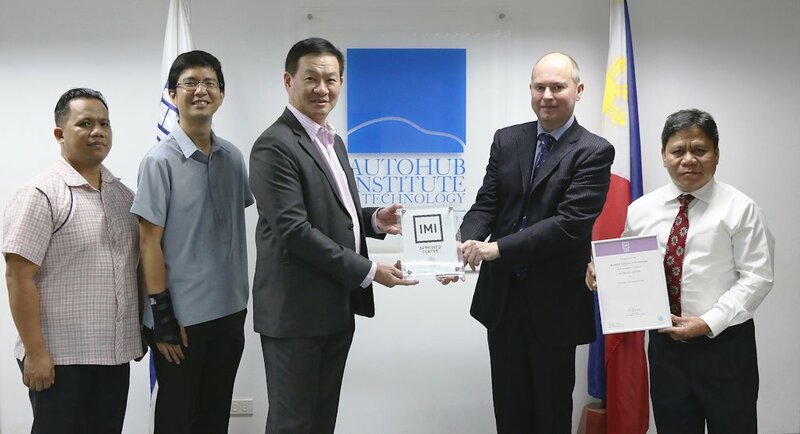 “We are delighted to be working with Autohub as an IMI Approved Center in the Philippines, and as we move into our 23rd market we are committed to working with industry leaders to improve the standard of training available around the world. Willy and his team are clearly focused on developing their workforce, and they also recognize the benefit of providing internationally-recognized qualifications to their multi franchise network. By providing their workforce with quality training, Autohub will also benefit the regions automotive sector, as well as their customers who engage with their dealerships. We at the IMI look forward to supporting Autohub in their journey to deliver first-class training,” said Mr. Matthew Stuart FIMI, Senior Manager SE Asia & China at IMI.